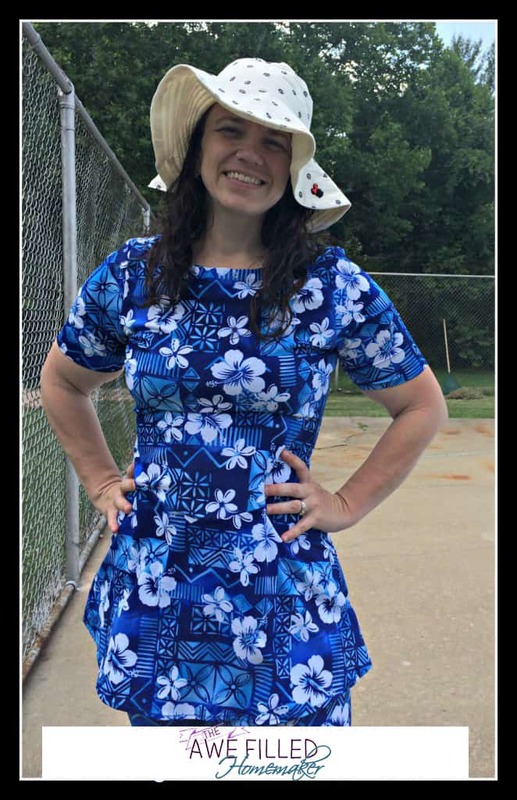 Modest Monday: Swimsuits and Summer Fun!!!! Ladies, I am so excited to now share with you Simply Modest Swimwear!!!! If you read my post HERE about my views on swimsuits, Simply Modest was one of the companies I had shared a link for. 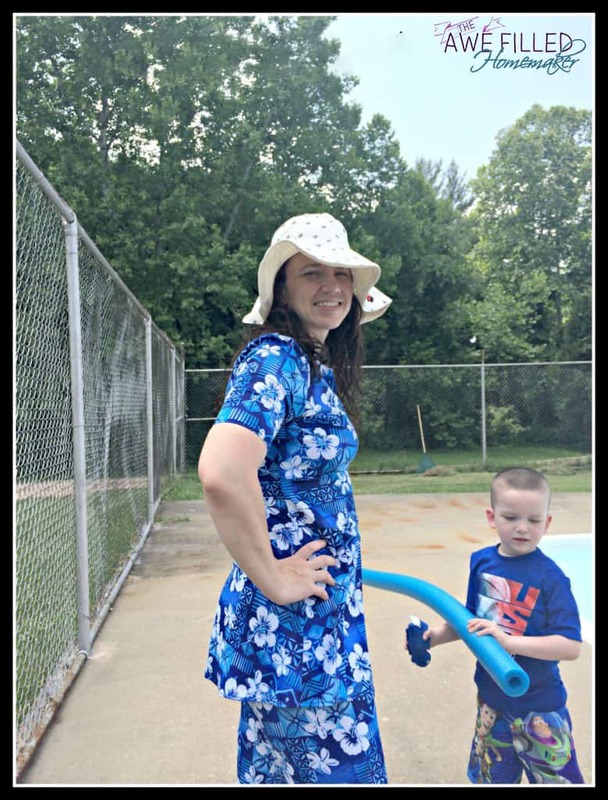 After that post, I was blessed with the opportunity to review a swimsuit from them and also to share this fantastic giveaway!!! One thing that I love about ordering from Simply Modest is that I can custom the suit to my specific measurements. No more buying swimsuits off the rack, being bound by the general sizes that are offered, the top fits but the bottom doesn’t (or vice versa)! 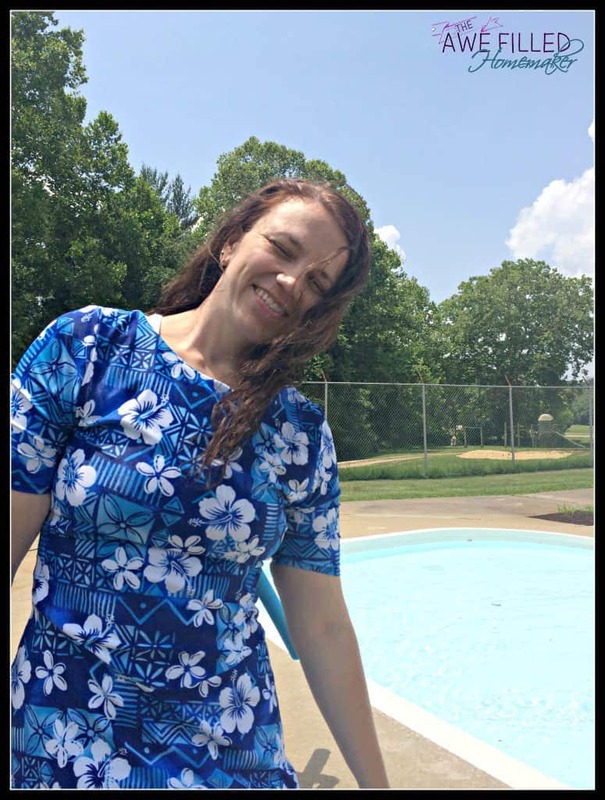 With Simply Modest, you just need your measurements and they can make a swimsuit specifically for YOU!!!! 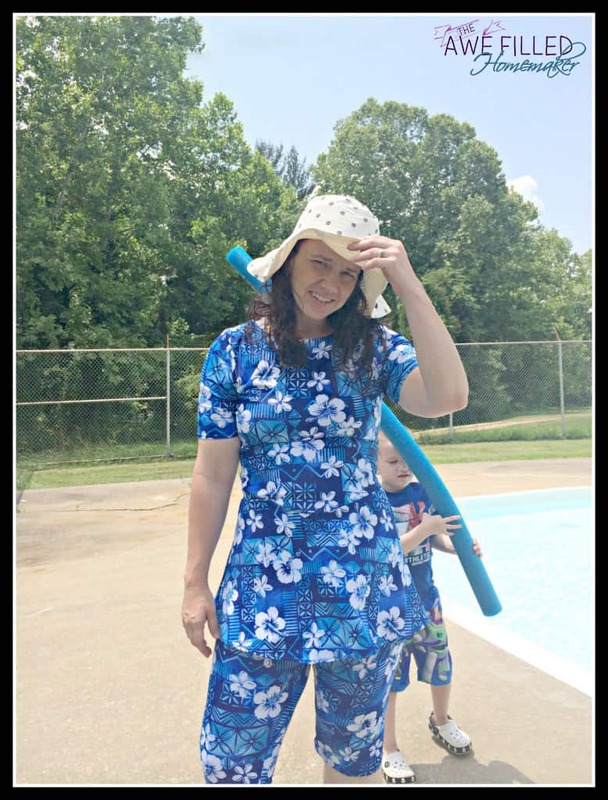 I know…..for once you can get a swimsuit that fits ALL over AND is modest!!! When I ordered mine, I specifically wanted the leggins to come below my knee (I have some awful varicose veins). You can customize the length of the leggins as well though! I, personally, like my leggins this length because they just seem to fit better. I love how it is modest but not frumpy. It is comfortable and also classy. The material is very nice! It is for sure a high-end swimsuit! There are many fabric choices to pick from. Everyone from young girls, teens, to adults and older ladies will be able to find something they like. So check out Simply Modest Swimwear and also like them on Facebook! Now for the giveaway! Follow the Instructions on the giveaway to enter. Keep in mind that if the instructions are not followed, your entry will not count. Sorry!!! 🙁 This is for ONE Simply Modest Swimsuit. Previous Post: « Diana and Friends Experience History Through Music GIVEAWAY!! Laura the first link for liking your FB page actually took me to the SwimModest FB page, I think you’ll want to check that out! I have been wearing skirts my whole life. I grew up in Florida with a pool in my back yard. 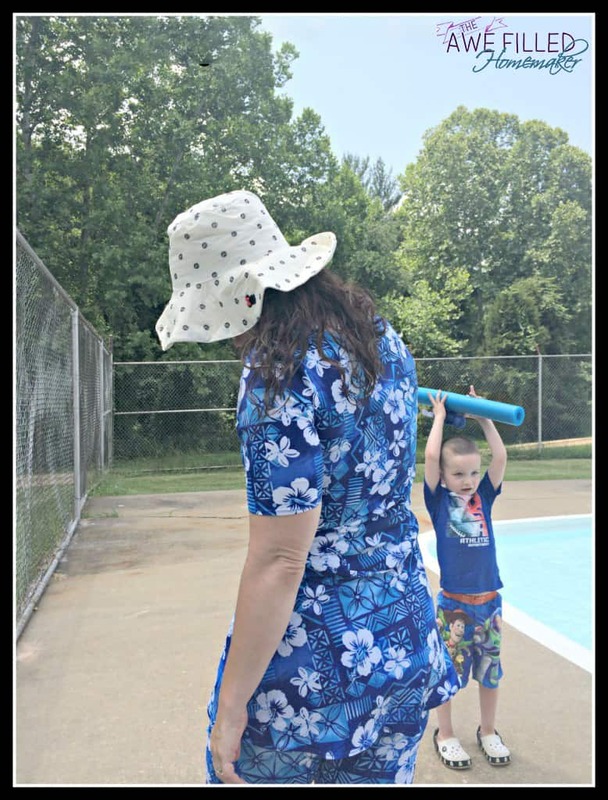 I always just uses culottes and a big t-shirt to swim. Now as an adult I have 3 children. I take them weekly to swim at the local community center and we go canoeing and to the lakes throughout the summer. I would love a modest swimsuit! I honestly need to learn to sew myself to make them for my daughter also. I want her to know that you can do anything you want in modest clothing and be cute at the same time. There is never a need to be not be modest. That’s for your blog! Oh man I could totally use this! I live in Florida, and i love these suits – but can not afford to purchase one! We are at the beach ALL the time!!!!! ~Jessica M.
Would love to enter your giveaway, but intentionally limit my time on the computer by not using Facebook, Twitter, Pinterest, etc.! Too much of a temptation for me to waste precious time with my kids! Thanks for your post anyway! I’d love a modest swimsuit to wear to the lake and pool. The quality I’m sure is better than a store bought. Thank you for this give away! 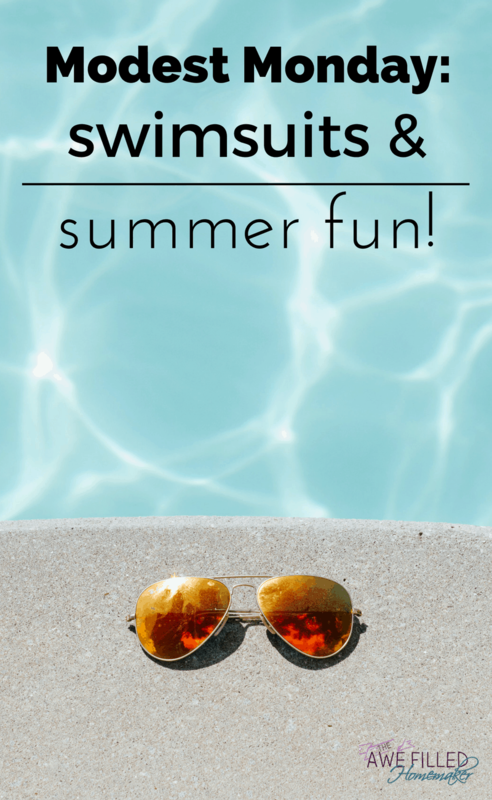 Modest swimwear is so hard to find, and I need a suit to keep up with my kids learning to swim! What an awesome giveaway! My swimsuits have gotten longer on the legs and higher on the chest as I’ve gotten older and wiser, so this is the perfect opportunity to try out one of the more modest swimsuits. 😉 or my daughter may like to try one… we’ll see! Thanks again! Thank you so much for the blog post! Finding a modest swim suite feels impossible some years! Thanks for the great review! I have always wanted to try their suits. We live in the South and have a pool. My girls all have suits from Dressing for His Glory, but I have never invested in one for myself. I love seeing other ladies committed to modesty. I would love one of these and would wear it swimming with the family, to the beach, or any time I was going to be doing water activities!! Thanks for the giveaway! I would love to wear one of these swimsuits, and I would love to have it to wear for the summertime. I have never worn a modest swimsuit in my entire life. I really need one of these to swim! I would love one of these as I literally do not swim because there are no mainstream swimsuits that I find modest enough right now and I just can’t budget in a $100 swimsuit right now. I would be ecstatic to win one of these swimsuits! I’ve wanted one for a long time, but I can’t afford them. I would wear it at family swim parties and at the local lake. Thanks for the chance to win! I would love to win this swimsuit as I just started dressing modestly this spring and I have absolutely no appropriate swimwear. I’d wear it on a trip with my family and my parents this August. I’m already wondering what I’m going to wear to the beach and lake! I would be so excited if I could win a swimsuit. I have wanted one for a long time, but can’t afford to buy one. I would mostly use it at family swim outings. I would love to win this. Right now, my modest suit consists of a baggy t-shirt and pair of Bermuda shorts. I have looked at a lot of modest swimsuit sites, but just can’t afford them. Over the past 3 years I have really had issues finding a modest swimsuit.. This is great! I would love to win this modest swimsuit. Modest swimsuits can be so expensive. I would wear this in our pool. I would love to win this because I haven’t had a properly fitting bathing suit in years! I miss out on so much water play with my kids. I would love to be able to give my daughter a modest swimsuit to show her that you can be modest and still go swimming! I would love to be a role model when it comes to swimsuits. I want to be able to show her that you can look cute and modest even when going to the pool.